This isn’t your typical, sweet, fruit crumble. The earthy-resiny flavor of rosemary and the gentle bite of thyme temper the natural sweetness of the pears and sweet potatoes. The hint of salt in the crunchy, nutty topping adds another dimension of interest. So, is this a dessert or a side dish? That’s up to you. I think it makes a particularly lovely and nutritious breakfast when warmed and drizzled with almond milk, or dolloped with plain Greek yogurt. Almost every ingredient in this dish, with the exception of the oats and agave nectar, contains potent anti-inflammatory compounds. Sweet potatoes, in particular, rank on every “top ten” list of anti-inflammatory foods that I have seen. The oats are tossed with just enough agave nectar (the equivalent of 0.3 grams of sugar per serving) to help them brown nicely, but not enough to make the dish truly sweet, and certainly not enough to be pro-inflammatory. 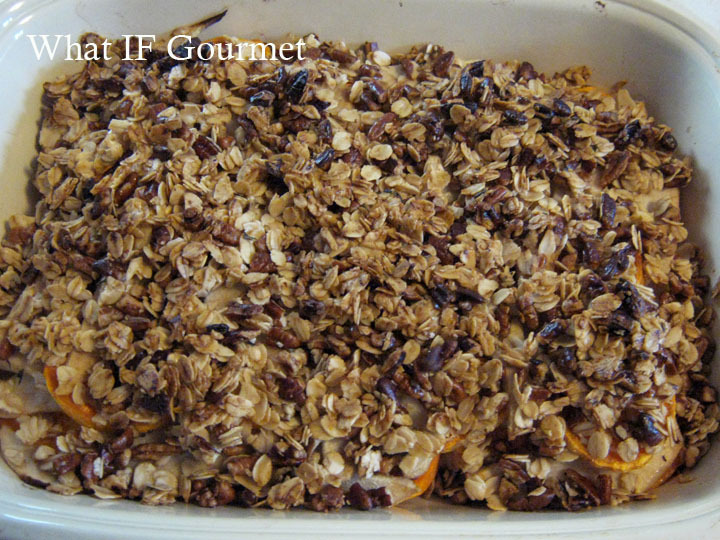 I’m looking forward to trying this crumble with different nuts and seeds in the topping, so please let me know if you experiment with it and hit on another great flavor combination! 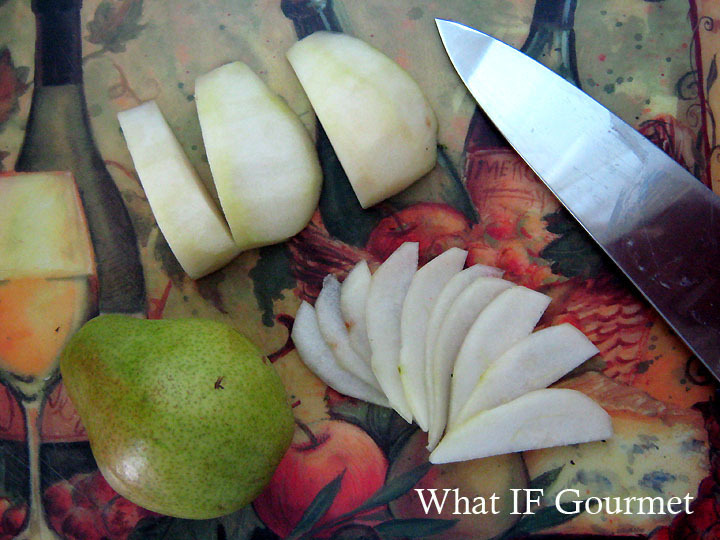 Peel and slice the pears about 1/8″ thick. Toss the sweet potato and pear slices with coconut oil and the chopped fresh herbs, reserving a hefty pinch of the herbs to mix into the topping. Pour the filling into a glass or ceramic baking dish (mine is about 9 x 12″). 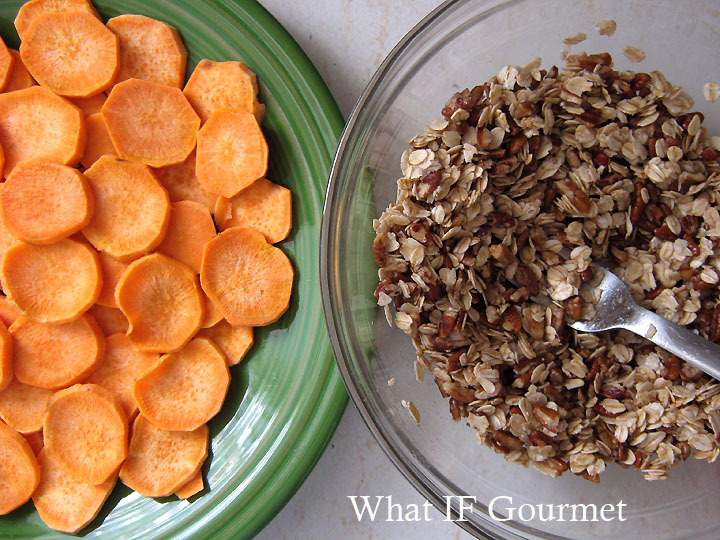 Combine the oats and pecans in a small bowl. Add the reserved pinch of fresh herbs, a generous pinch of salt, 2 Tbsp coconut oil, and 1/2 tsp agave nectar. Toss until well combined. 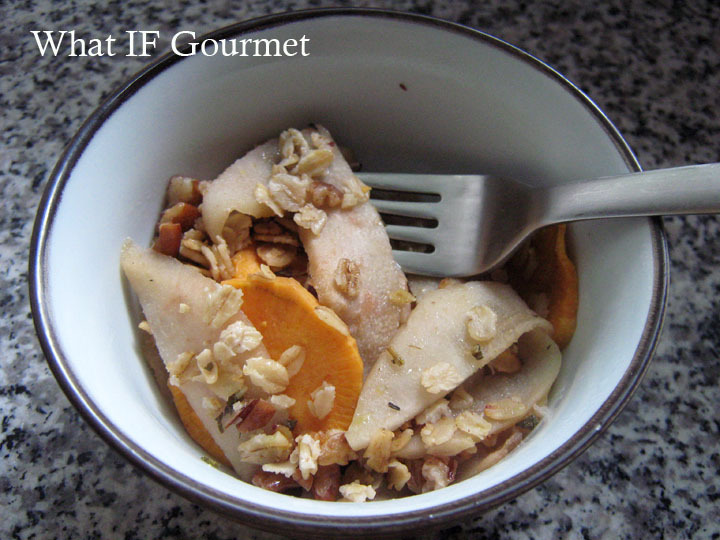 Spoon the topping evenly onto the sweet potatoes and pears. Bake for about 40-45 minutes, until filling is soft and topping is browned and crisp. Let cool for a few minutes before serving. Tastes great warm or at room temperature. Makes 8 servings. 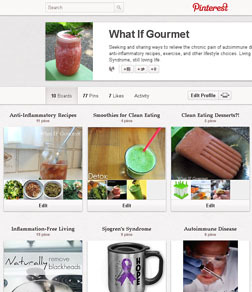 This entry was posted in Anti-Inflammatory Ingredients, Breakfast, coconut oil (virgin/ unrefined), Dairy-free, Entrees, fruit, Gluten-free, herbs, nuts, Recipes, root vegetables, Snacks, Vegan, Vegetarian. Bookmark the permalink. Savoury crumbles rock! Always superior to the sweet versions. Justin, I am slowly discovering the infinite joys of the savory crumble. Thanks for the confidence boost!